Microsoft's cloud revenues are doubling annually, according to Channel Chief Jon Roskill, speaking at Microsoft Worldwide Partner Conference (WPC12) in Toronto. He's describing how Microsoft is increasing partner cloud incentives by 40 percent. "Don't hold back, don't hold back, don't hold back," Roskill chanted to partners. Microsoft’s cloud revenues are doubling annually, according to Channel Chief Jon Roskill, speaking at Microsoft Worldwide Partner Conference (WPC12) in Toronto. He’s describing how Microsoft is increasing partner cloud incentives by 40 percent. “Don’t hold back, don’t hold back, don’t hold back,” Roskill chanted to partners. Up soon: Microsoft COO Kevin Turner, who is bound to take aim at rivals like Apple, Google, Oracle and VMware — among others. Here’s a minute-by-minute update from the keynotes. During partner meetings, partners usually have “optimism with just a bit of skepticism. But everyone is optimistic about stepping into the cloud” now, Roskill asserted. Microsoft builds cloud platforms that are extensible so that partners can win. Other companies will tell you they’re partner driven. But the proof is in the pudding; 95 percent of Microsoft’s revenues go with and through partners. Rivals can’t make that claim. You, partners, are the best sales force in the world — bar none. Microsoft says it had 114 percent growth year over year in the cloud. We will see a radical trajectory on our revenue line — thanks to Windows 8 and Office 365 killer combo. Our field will not make the big bucks until they hit cloud revenue targets. Microsoft is growing its incentives to partners by 40 percent in 2012. Those incentives focus on cloud computing. 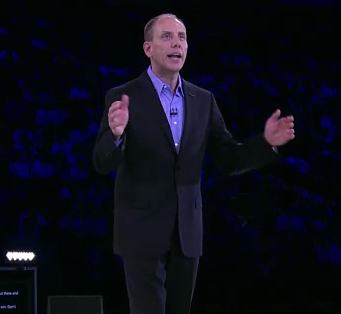 Up now: Turner, who is describing Microsoft’s long-term strategy in the cloud and partner strategy vs. Oracle and IBM. Here’s a recap.